Viscosity is an essential property to characterize fluid behavior at flow. 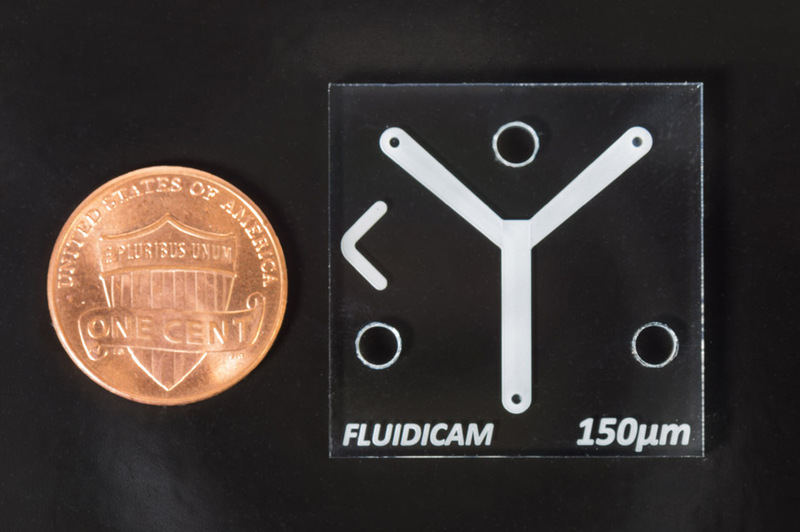 FLUIDICAM is designed to measure flow curves of products with various consistency (liquids, gels or semi-solid emulsions…) by combining microfluidic and imaging technologies. Viscosity as a function of shear rate and temperature is measured in a single click set-up, free of calibration. Microfluidic principles used in FLUIDICAM provide fast, precise and high shear rate viscosity measurements. Two fluids pushed together in a microfluidic Y-shaped chip flow laminarly. The interface between the sample and a reference solution can be observed. A high resolution camera detects the contrast difference between the sample and the reference fluid, identifying the position of the interface. Depending on the sample viscosity, flow rates and chip dimensions, the volume occupied by each fluid changes. Thus, FLUIDICAM measurements are based on a simple relation between flow rates (adjusted by the software), viscosity of the reference (known), and position of the interface, which is observed by the camera. Designated software automatically adjusts flow rates of both fluids to reach desired shear rates, and centralize the position of the interface for higher precision. Small flow cell dimensions contribute to high confinement of the flowing fluid. Thus, only a small sample volume is required to determine the viscosity and high shear rates are easily accessible. In couple of minutes, FLUIDICAM plots sample viscosity at selected shear rates by automatically adjusting flow rates. Additional replicates can be made with no user intervention nor resampling and always working on a fresh sample. 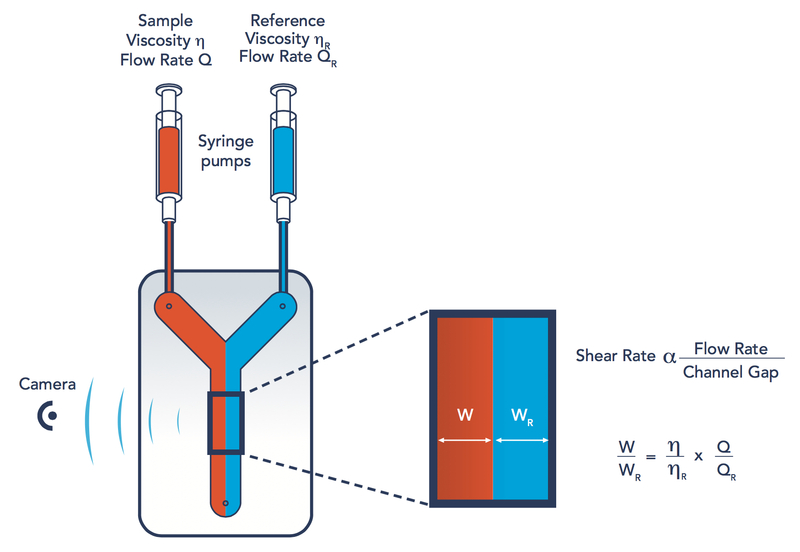 In a single experiment setup, it is possible to screen sample viscosity as a function of shear rates and temperature. Only a small volume needs to be heated, making temperature control fast and accurate. Thanks to the dedicated camera, it is possible to visualize the inside of the channel at any time, before, during and after the experiment. Data treatment allows to visualize the resulting images, and exclude any incorrect image, making the measurement even more reliable.